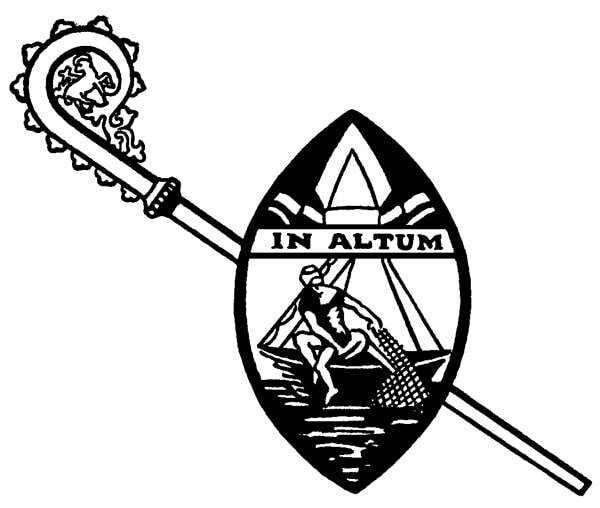 The current shield of the Diocese of Fond du Lac is the second such shield and was adopted during the episcopate of Bishop Brady. Evolved from the coat of arms historically used in the mid-12th century to identify allies, the use of shields has expanded. 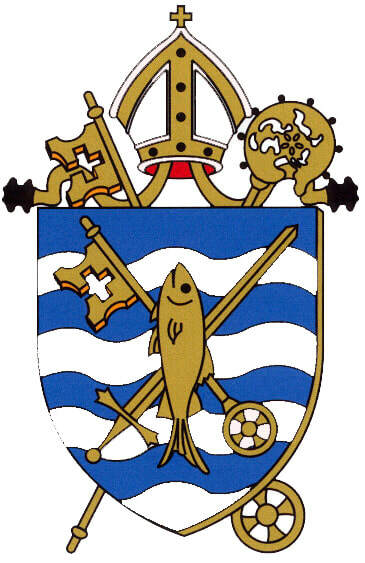 The design is a unique symbol and many shields are still in use by a variety of institutions and individuals. As with all shields, it is meant to convey a number of meanings. Gold - represents the riches provided to spread God's kingdom in the diocese and reflects that Jesus is the Head of the Church (Colossians 1:18). The color traditionally represents generosity and the elevation of the intellect. Blue - represents the many rivers, streams and lakes that are in the diocese and reflects that God provides the water of life (John 4:14). The color traditionally represents truth and loyalty. Red - represents the sacrifice of servants to build God's kingdom in the diocese and reflects that Blood of Christ, the Lamb of God (1 Peter 1:19). The color traditionally represents martyrs. White - represents the seasons, especially winter, experienced across the diocese and reflects our Salvation through our Lord Jesus Christ (1 Thessalonians 5:9). The color traditionally represents purity and salvation. Wavy lines - represents the many rivers, streams and lakes that are in the diocese, especially Lake Michigan, Green Bay, Lake Winnebago, the Fox River and the Wisconsin River. (John 4:14). Mitre - represents submission to the authority of the bishop. (Hebrews 3:17). Crozier - represents watchfulness to respond when there is need, like a shepherd might respond to sheep. (Acts 20:28). Crossed Key and Sword - represents St. Peter's keys of the Kingdom (Matthew 16:19) and the sword of the Spirit (﻿Eph. 3:1﻿), traditionally a symbol of St. Paul. This shield was included in the book Heraldry in the Episcopal Church: How ecclesiastical coats of arms depict the history of the church (1993) by Eckford De Kay and published by Acorn Press.